Organic Solutions sets itself apart by exclusively utilizing BioFeed products. We use exclusively an advanced line of liquid biotech products that solve a variety of issues associated with agriculture, aquaculture, landscape management, municipal waste and environmental pollution. These bio-products are based on nearly 30 years of field research and development beginning in 1986. These formulations are enzymatically produced using a balanced combination of hydrolyzed plant proteins, natural enzymes, intracellular extracts, complex organic acids, carbohydrates, vitamins, hormones and nutrient elements. 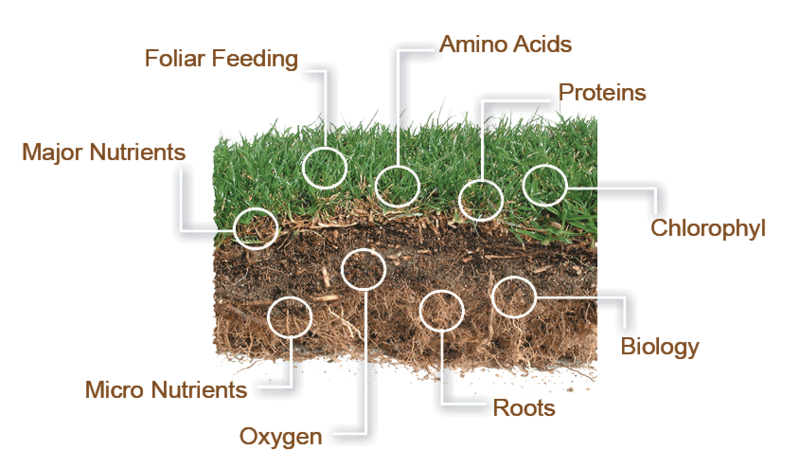 This vital enzymatic process is used to produce our Amino-Carbon Technology (ACT). A variation of nutritional combinations of ACT and nutrients are used to formulate over 55 different Biofeed products. Biofeed products deliver a compelling growth promoting effect at the cellular level to facilitate minute changes that bring dynamic results. Biofeed products work in harmony with nature. Since smaller amounts of fertilizer are applied and readily absorbed, combined with the use of organics, there is virtually no run-off that can pollute ground water or the lagoon. All of this results in a big financial savings while enhancing the environmental performance of a landscape and providing a better, healthier and safer alternative to applying synthetic fertilizer products without harming your pets, family, or the environment.